Have you been looking for a way to make your pup(s) really happy? 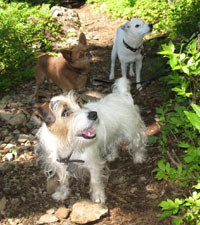 Haven's Hounds is a mid-day dog walking service offering half hour walks, hour walks and pack walks . My focus is to alleviate the boredom and loneliness a pup experiences when its Master is away at work. I believe that the exercise, love, consistency and companionship combined with an experienced dog walker (I am the only dog walker) will ensure that your pup's day is a really happy one. Additional services such as vacation care, short pit stops (other critter care) are available upon request depending on availability. I will meet w/ you and your furry best friend for a free consultation. From Puppies to Seniors your pups will be treated with love as one of my own. I bring over 25 years of dog walking experience, Natural dog food sales, dog training, references and a wonderful positive attitude that your pup will love. Your pup explores the Queen Anne neighborhoods sidewalks, parks and retail stores for socializing, fresh air and fun. You pup(s) will enjoy an on leash "pack walk" through the neighborhood of Queen Anne w/ occasional off-leash play time in safe areas. Each additional dog per family is $5.00 per 30 minutes.